Throughout 4 days in July (Wednesday 26th to Saturday 29th) Aire Libre set forth on an adventure that took us into the depths of the Tohono Oódham Nation, a Native American tribal community whose geographical epicenter is one of the most controversial in the world: the Mexico – USA Border. Our purpose was to run the territorial desert paths of the Tohono O’odham or “People of the Desert” for the purpose of getting to know them, connect with their culture and better understand their current context. The adventure was the end result of the collaboration between the French team of Neuf Dixieme and Aire Libre. This joint venture rose from a sudden invitation to Northern California to run with Rickey Gates, an athlete who was in his last stage of his #transamericana project, consisting of running from Charleston, South Carolina to San Francisco, California (4,000 miles, nearly in 5 months). Rickey documented his progress as well as the many stories of all the persons he encountered. After the powerful experience with Rickey Gates, we travelled southward by land to Sells, Arizona, crossing fascinating views of imposing mountains and inhospitable deserts. 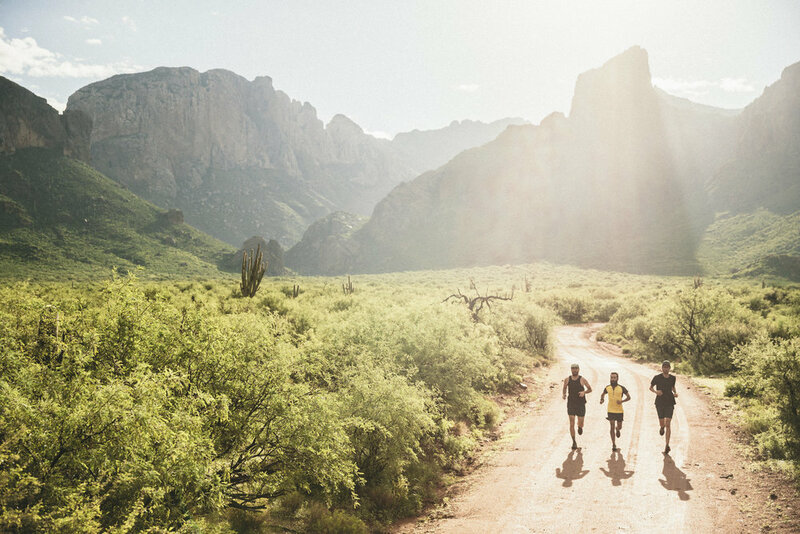 The idea of running with the Tohono O’odham turned out from one of the members of Aire Libre, who months earlier had passed by that area and found out about this tribe whose territory and customs were fragmented in the 19th century when a border line was imposed, thus splitting their native land in two. It was then decided to contact this community and propose that we run together through their land. The response obtained surpassed all of our expectations. In a most generous unimaginable manner they opened the doors of their homes and warmly embraced us. Running with them allowed us to discover a fascinating human group with a potent history, vibrant traditions and a prevailing complex situation. The following is the story of our experience in immersing ourselves in the Tohono O’odham Nation. The traditional territorial heart of the Tohono O’odham is cut into two by the borders of Mexico (Sonora) and the United States (Arizona). It is considered as one of the most controversial geographical limits in the world, due to the fact that thousands of people from Latin America seek to go clandestinely across in search of the promise of a life in the United States yielding better economical possibilities. Overnight, this complex geopolitical situation fell right into the Tohono O’odham homes, who were dedicated only to their own lives and businesses. 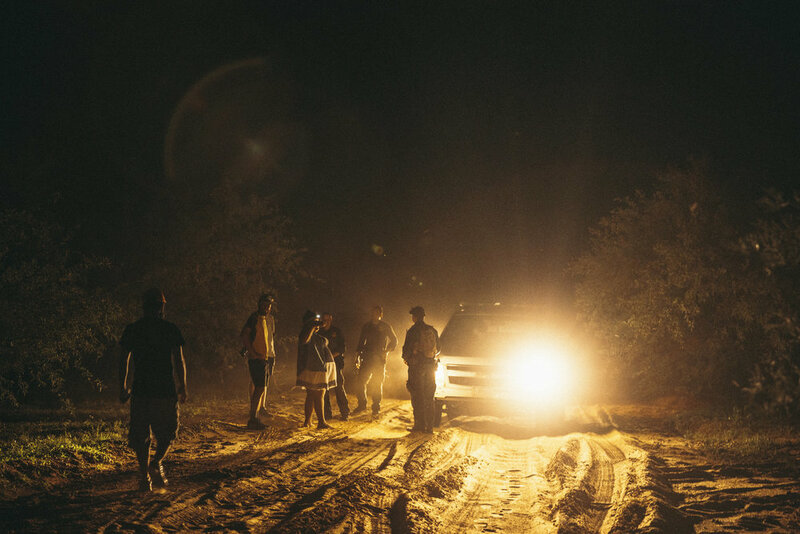 The border not only brought within the truth of thousands of migrants crossing from south to north, but it also divided the Tohono O’odham community by isolating nearly 2,000 tribe members on the Mexican side, leaving them without free access to be with their families on the United States side. 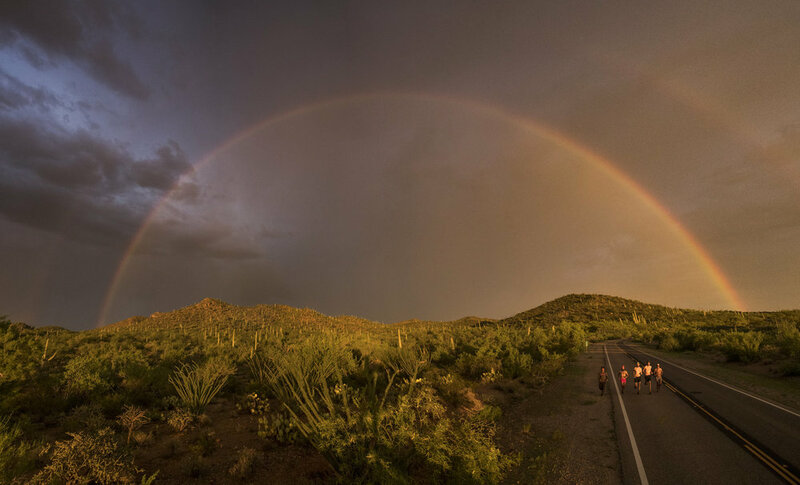 Nowadays, some Tohono O’odham Mexicans have the possibility of crossing their Nation with special permits into Arizona; however, many others are not granted this because of illegal immigration as well as drug trafficking. Running through that land made us become aware of some of that tension present along the border line. 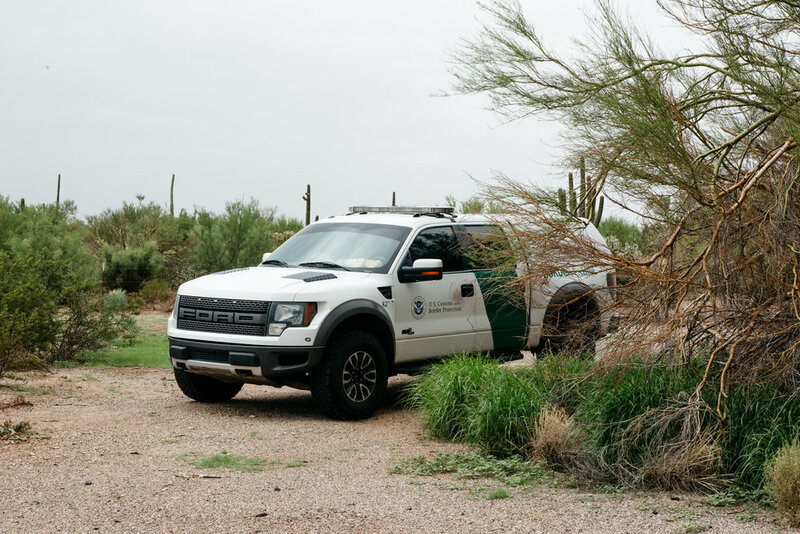 The Border Patrol Agents were guarding every corner of that place, hiding between trees, covering the pathways and asking for documents to all those whom they considered to be suspects. We found on the ground of a dirt road a slipper which is used in order to not leave trace on the desert sand, Mexican coins as well as other marks of clandestine walkers. Still an eerie sensation was present at all times when turning on a curve we could potentially bump into one of them. On top of this, there’s also what the Tohono O’odham are going through right after Donald Trump being elected and his ever-present threat of building an enormous wall in the border. Logically, this wall would cause even more complications to the Tohono O’odham, amplifying the isolation level with their Mexican relatives. The wall could also affect negatively the natural ecosystem that exists in this area by blocking the natural flow of animals, affecting plants as well as the landscape which has subsisted in equilibrium and harmony for eons. This is why these people are verbally opposed to this hostile initiative. 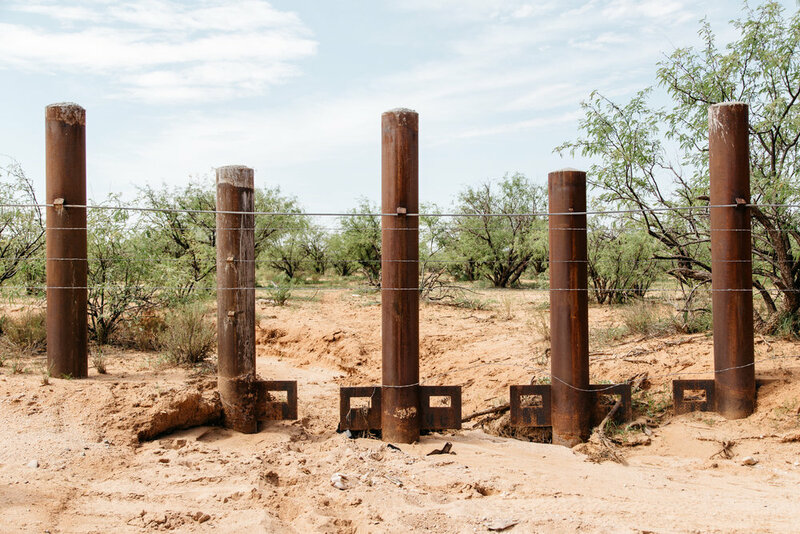 This leads us to perceive and understand that an uncertain atmosphere of resistance exists in those Tohono O’odham native lands with regard to the controversial border situation. A standing that directly affects these people and which evokes feelings of worrisome. Being aware of this fact can gradually lead to finding solutions that could help relieve these complex circumstances. 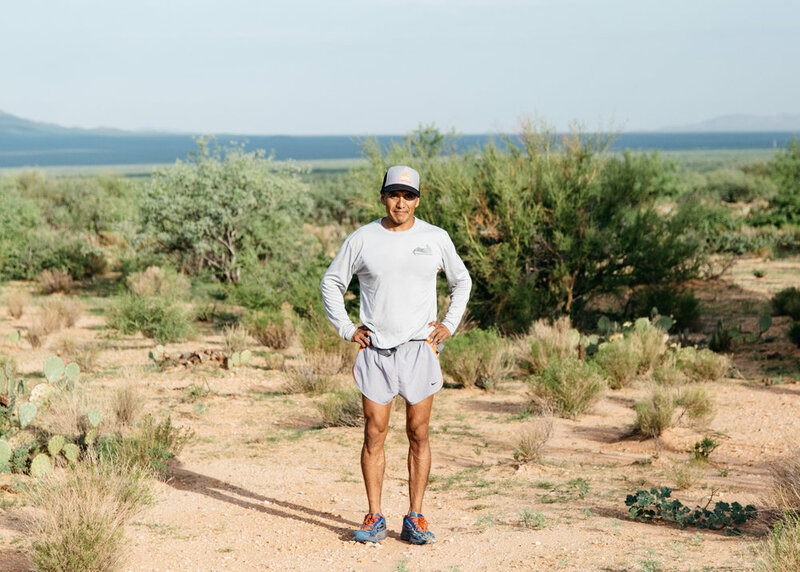 On any given day 100 years ago, it would have been normal for a young Tohono O‘odham to wake up very early, adjust his sandals and go out running in the direction of a neighboring community in his Nation. Most likely the purpose of this would have been to deliver an important message, since that was the way that news and the latest events would spread out in that desert land, the size of the state of Connecticut. “The runners were like our old telephones”, Amy, a local culture teacher told us. In this way, running was an habitual part of the young members of this tribe.Running was present in the practical and mundane, as the former messenger example, but it was also present in the uppermost spiritual and sacred. 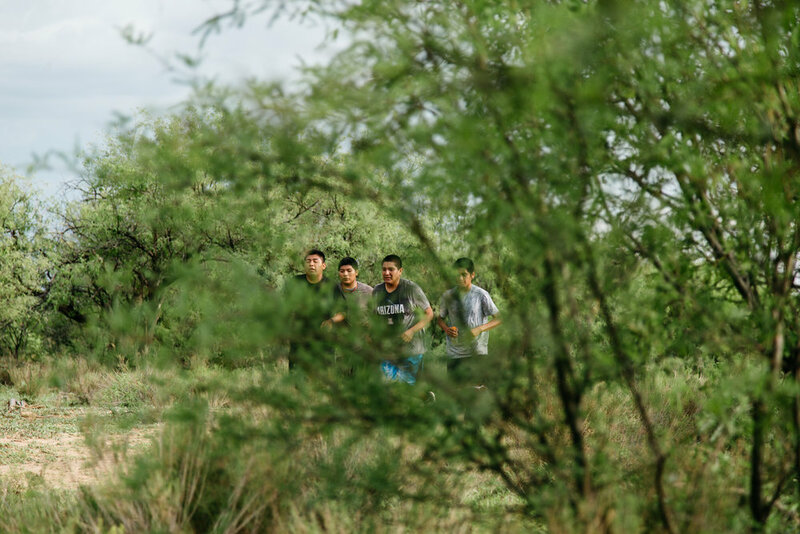 The Tohono O’odham sought out to run to celebrate that a good harvest would turn up, to seek their creator’s support in times of crisis, to honor their ancestors and to prepare for their usual ceremonies, Sometimes they ran a few kilometers and other times they ran many. Even the ritual in which the young Tohono O’odham men come of age consists of running from the northern limit of their territory to the Sea of Cortes, almost a distance of 200 kilometers towards the southwest, on the Mexican side of the state of Sonora. They call it the Salt Run and it represents a hard resistance test of both bravery and faith. When they finally reach the Gulf, they gather salt and seashells, which they take back to their communities as an offer that brings them blessings and spiritual medicine. The medicine that they carry within ends up not only healing both the souls of their native communities’ brothers and sisters souls, but also their own. So for the Tohono O’odham running has in effect the power of healing the soul. Nowadays, they do not run as much. Their total of kilometers has declined, although a lively desire exists of recuperating those beautiful traditions. 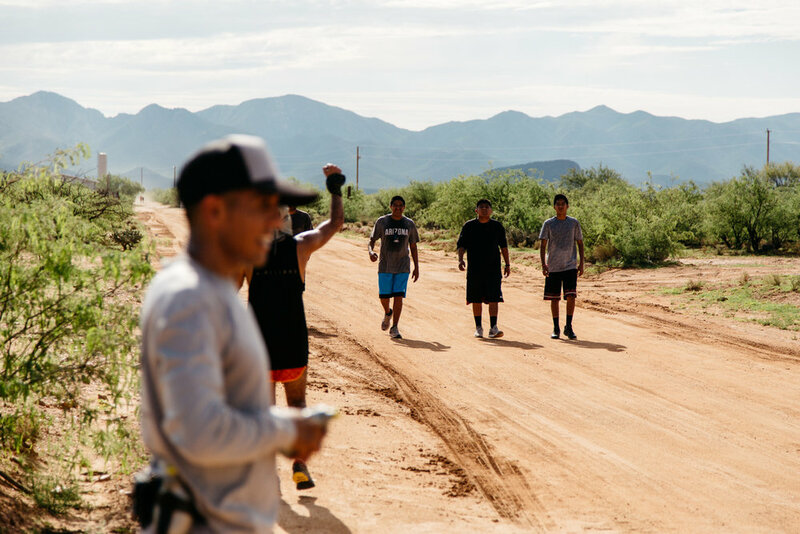 Recently, Anthony Francisco, our gracious host in the Tohono O’odham Nation did his own Salt Run a few years ago and was also close to two other local young men, Troy and Shane, who also did theirs. The tradition thus continues to be alive. 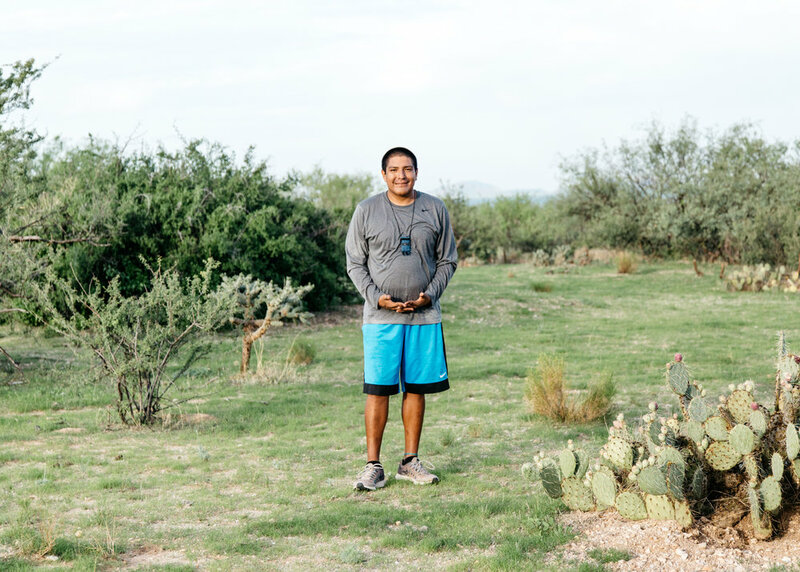 Besides being a running people, the Tohono O’odham have also been historically a community that lives literally in the middle of nature. They consider their lands a sacred territory, which they inherited many centuries ago from their ancestors. We had the privilege of receiving the invitation to spend the night camping out by the feet of an impressive red-stoned mountain with the name of Baboquivari, which happens also to be their most important sanctuary. It is there, in a cavern below the largest peak of Baboquivari, where I’itoi, the O’odham’s creator spirit and to them their elder brother, lives. The different communities thus periodically go on pilgrimage trips to Baboquivari and up to the holy cave, where they take their offerings and prayers to I’itoi. I’itoi is also the character of the Labyrinth Man, the shield and official symbol of the Tohono O’odham. The symbol is rather an accurate analogy of our existence: a human being figuring out an uncertain path in that maze which in the end is life. This part of their traditions we found to be the most relevant and intact, but others, as mentioned with the Salt Run, have not had the same fate and are gradually fading away. The young are no longer interested in learning the native language and schools do not emphasize this enough. It would seem like the influence of United States culture pulls them, like a huge magnet, in a direction opposite to their traditional ways. Fortunately, people like Amy, Anthony Francisco, Frederick Pablo, and Rebecca, a Harvard alumnus, amongst others whom we met are undertaking an active and conscious effort to once again extol the unique value of the traditional culture present in this historic area. They are pushing so that the original language lessons return to the classroom, so that more youngsters participate in the traditional races and in general to recover their relationship with the ancestral elements of their cultural heritage. 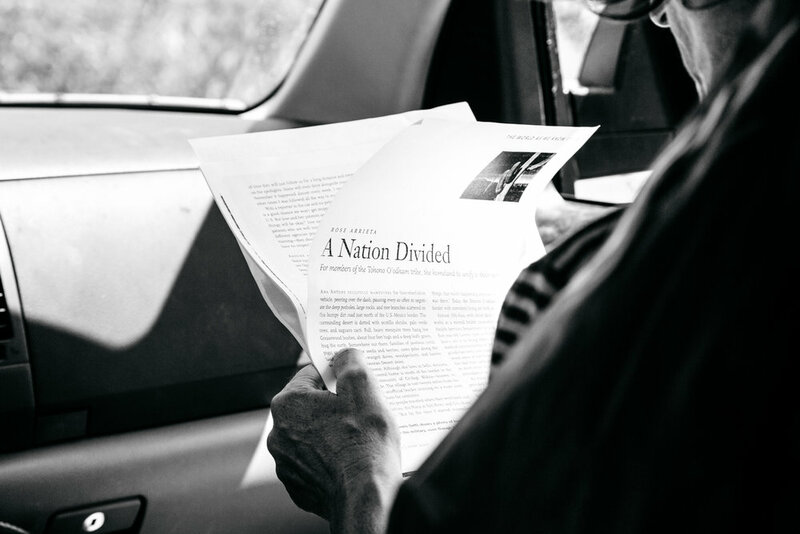 Many of the changes which have been developing in the Tohono O’odham Nation are due to the inevitable assimilation of North American culture, which now encircles them in its different dimensions: geographic, political and social. Being on the northern side of the border brought positive things, such as having access to the United States healthcare or social security systems. Nevertheless, unforeseen consequences also came with the changes, and their complexity continues to represent a series of challenges to modern Tohono O’odham society. One first aspect, which is evident at first sight, not only to those of us who visit from outside, but also to the locals who openly speak about it, is the situation of obesity that prevails amongst the people of their communities. With the introduction of foods with high amounts of sugar, fat and preservatives which came with the expansive industrialization of the United States of America, the Tohono O’odham radically changed their traditional eating habits. At the same time, access to motorized vehicles and the introduction of more sedentary entertainment such as television, has led them to be less physically active. Where once they ran to deliver an important message, nowadays WhatsApp does the same with just a tap of their thumb. This dangerous combination of sugary, fatty and salty diets, along with a lifestyle devoid of sufficient physical activity, has unfortunately been the one of the main causes of a declared diabetes epidemic. If diabetes does not attack, then it is cardiovascular diseases. A second aspect, less visible than the former, but which we heard mentioned several times, is the one caused by a youth perhaps unable to process all of these vertiginous and recent transformations around them. Stories were told of young people involved in gangs and addictions. These are probably the most obscure consequences of a broader situation of economic difficulty, one in which we can see a people struggling to adapt their traditional ways of living to the modern economic system. There’s light at the end of the tunnel. We had the opportunity to visit health centers with state-of-the-art facilities that have been built in strategic points of the Reservation. These centers are a sort of fusion between a sports gym, a kitchen and a medical office. They have access to exercising equipment that looks brand new, a space where locals can learn how to cook with natural, nutritious ingredients and they can also get medical check-ups to monitor their health. All of this is within their reach and at no extra cost. This project of a joint run between Aire Libre and members the Tohono O’odham Nation constituted to us a symbol of unity. As mentioned before, his Native people has suffered many complications ever since an international border was imposed on them, dividing their territory into two parts. Nobody asked for their opinion for that matter and they have been stuck in the middle of many of the historical territorial disputes between the United States and Mexico.This project of a joint run between Aire Libre and members the Tohono O’odham Nation constituted to us a symbol of unity. As mentioned before, his Native people has suffered many complications ever since an international border was imposed on them, dividing their territory into two parts. Nobody asked for their opinion for that matter and they have been stuck in the middle of many of the historical territorial disputes between the United States and Mexico. For them, division doesn’t exist, because when they look southward towards the international line, what they see is neither a country nor a land different from than theirs. It is actually all part of the same. Having said that, what they desire the least are reasons for division, such as a gigantic border wall in their backyard. It was right in the middle of this context that 3 Mexicans and 2 people from France came together to form a single group with the O’odham, one which became a melting pot of a single running being logging miles through that desert. The message we expect to share is that the fact that we come from different sides of the border or even from another continent does not have to mean that we are divided. These are imaginary lines, created by men, often in arbitrary ways. They legally exist of course, and as proof of this we have the heavy concrete columns, razor sharp barb wire, intimidating police control-towers and swarms of Border Patrols constantly sweeping the entire area. Nevertheless, coming from a different land should not create barriers between us as human beings. Whether we are Mexican, French, O’odham or North American, in the end we all share a common human connection. Perhaps unknowingly, what modern man seeks is exactly that: unity. In his awarded Labyrinth of Solitude, Octavio Paz wrote reflecting on men who feel they are on their own, isolated with their own problems and beliefs of groups of humans different from themselves: the others. That solitude is the sinister root which lies at the origins of our wars, our hatred and the distance or mistrust which we feel divides us from people of other nationalities or race. The antidote which is able to cure this condition is precisely human connection, or that feeling that we are part of one great humanity with whom we share our DNA and the same basic needs and wants: security for our families, education and health for our children and the possibility of being able to pursue and accomplish our lives’ dreams and goals. It is of the utmost importance that we pause, look within and raise our awareness so that we don’t allow worldwide geopolitical barriers to have the power of becoming barriers between our essence and that of our other human sisters and brothers. The solution to our problems of solitude and division is to allow ourselves to open up, so that we are able to connect with all of the richness that each person in this world has to offer, simply because they exist. For all of this we visited this fascinating human group living in that beautiful desert corner of Arizona. Running together we experienced the gift of connecting our hearts in such a way that they became one. WE ARE ETERNALLY GRATEFUL FOR THE SUPPORT AND HOSPITALITY OF ANTHONY FRANCISCO AND THE MEMBERS TOHONO O'ODHAM NATION.